The Revo Intercooler utilises unique design features to lower intake air temperatures, minimise pressure drop and allow the engine to produce impressive power and torque with Revo Software. The unique end tank profile promotes internal laminar flow by decreasing turbulence and increasing airspeed into the bar and plate core. This enhances charge air cooling giving you access to more power throughout the rev range. The limitations of the stock intercooler were apparent throughout testing. The stock part consistently struggled to manage charge air temperatures, even under normal driving conditions. The Revo Intercooler has been designed to improve on every restrictive element of the stock cooler, enhancing cooling efficiency by lowering intake air temperatures by up to 36ºC vs. the MQB Golf R intercooler, allowing you to drive harder, for longer. 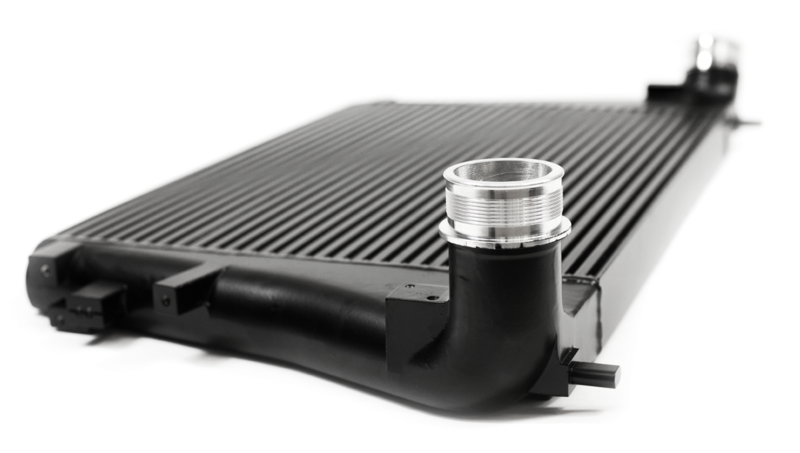 The Revo Intercooler was built around a simple principle; create a cooler that can keep up with your demand for power. Designed from the ground up, the Revo Intercooler has much larger core volume than the OEM part and offers perfect fitment, improving cooling by utilising the full volume of the stock location space as well as cold ambient air from the front of the vehicle. The stock end tanks are inefficiently designed and create turbulent air in corners. These sections create a natural flow distribution but slow charge air and increase pressure drop. The Revo end tank geometry maintains the largest possible cross-sectional flow area to and from the core. Coupled with a cast interior surface finish, the Revo end tanks allow air to flow freely without obstructions from turbulent air pockets found in the OE intercooler. End tanks play an important part in maintaining pressure and work in harmony with the core to promote airflow, the Revo end tanks are designed to offer the optimal balance between both of these key features. Designed with a bar and plate core to maximise the efficiency of heat transfer, the pressure drop is also controlled as the air meets less resistance compared to that of a tube and fin alternative. The Revo Intercooler also features carefully specified fin geometry to maximise cooling properties while minimising flow restriction. 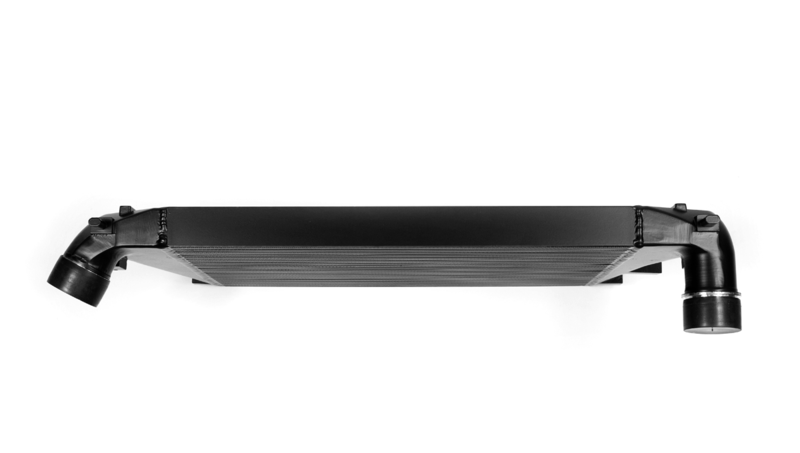 The ambient core side utilises louvred fins to slow ambient air flow which improves heat transfer, while the charge core side features an offset internal fin design to balance surface area and air resistance to minimise pressure drop. 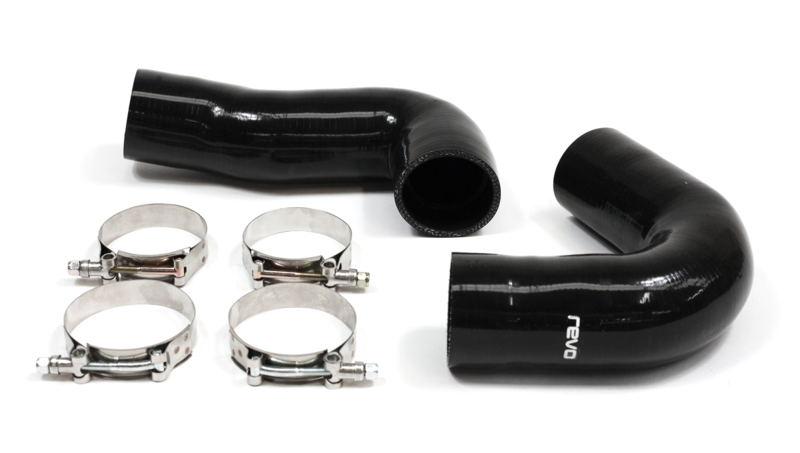 Supplied with stronger oil resistant silicone hoses, the Revo Intercooler can be installed using the stock pipework or recommended Revo Intercooler pipework. The internal diameter of each silicone is precisely matched to the outer diameter of the ribbed inlet and outlet connections along with a unique Flush Fit design, allowing a smooth transition between components. 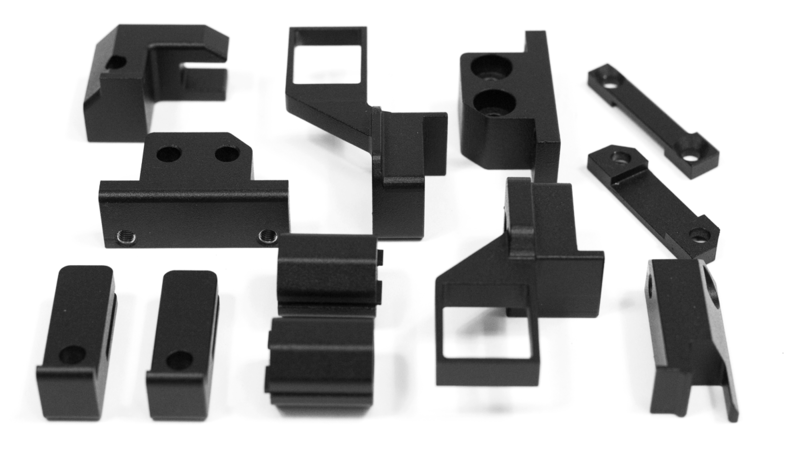 To ensure precision fitment, Only Revo offers a CNC machined bracket system. Produced to a superior tolerance than that of a cast mounting system, this unique feature also ensures that the supporting brackets are strong and less prone to failure. All Revo products are designed in-house using the latest 3D printing technology, CAD and CFD software. Every product is rigorously tested utilising an in-house Hub dyno and Revo data acquisition software. The Revo intercooler minimises turbulence while maximising heat transfer, promoting cooler air temperatures and low-pressure drop. This helps retains power and torque throughout of the rev range as highlighted during controlled Dyno testing. The Revo Intercooler was tested in-house to compare the performance against that of the stock Intercooler. First tested on a vehicle running the OEM Intercooler with Revo Stage 2 software, a Revo air intake system and Milltek downpipe, the Revo Intercooler was then installed and tested in the same controlled environment to highlight the benefits of enhanced cooling. Showing the last of five consecutive dyno runs, the efficiency of the Revo Intercooler over the OEM Golf R intercooler is highlighted. 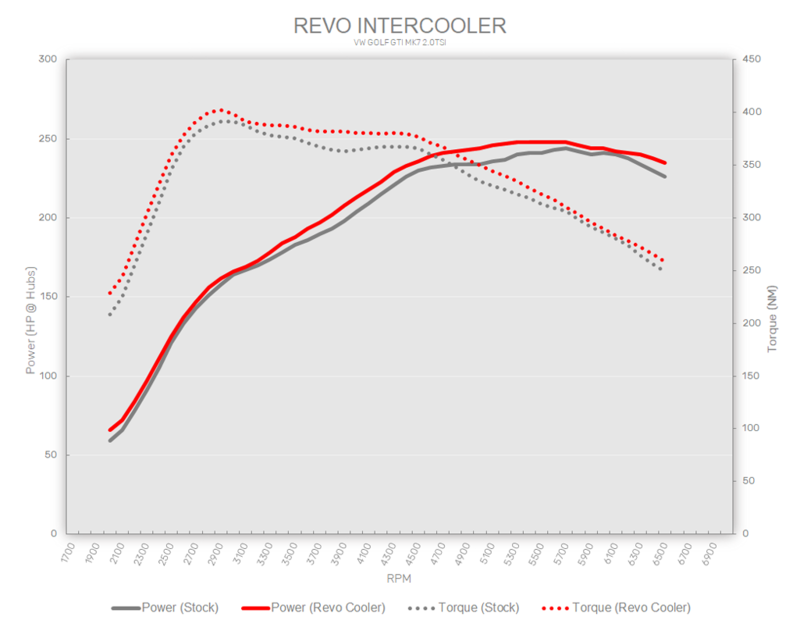 With max gains of +10 HP & +20NM Torque, along with increased performance throughout the entire rev range, the stock intercooler struggles to effectively function in comparison to the Revo Intercooler which remained consistent throughout, losing just 2% peak power over the 5 runs compared to 5% on the stock cooler. This is a metric used to confirm that testing on the Revo MQB Intercooler. This is used to show that the air temperatures going into the intercooler were similar for each test, confirming that outlet temperatures shown in the following graphs are purely down to differences in intercooler design/construction. 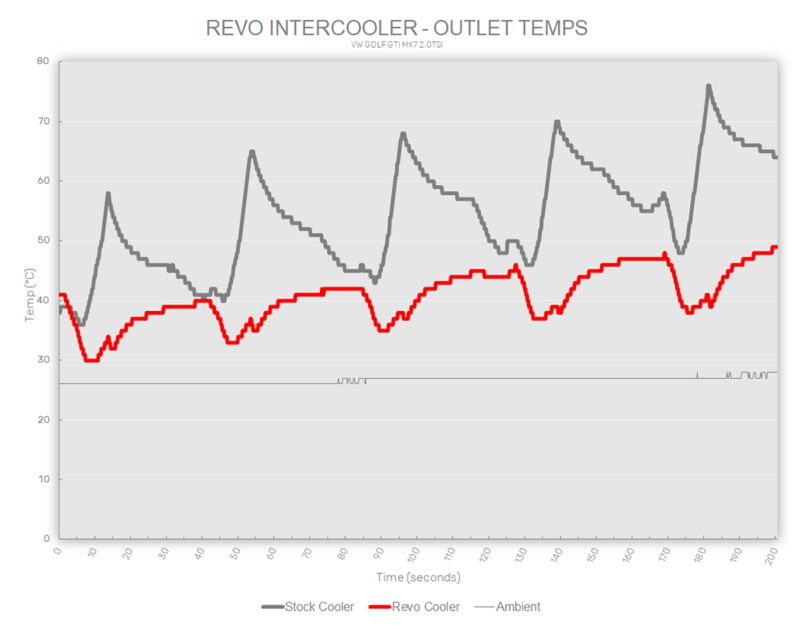 As can be seen, the inlet temperatures during testing were hotter on the Revo Intercooler, yet the Revo intercooler produced the lower outlet temps proving the cooling efficiency. 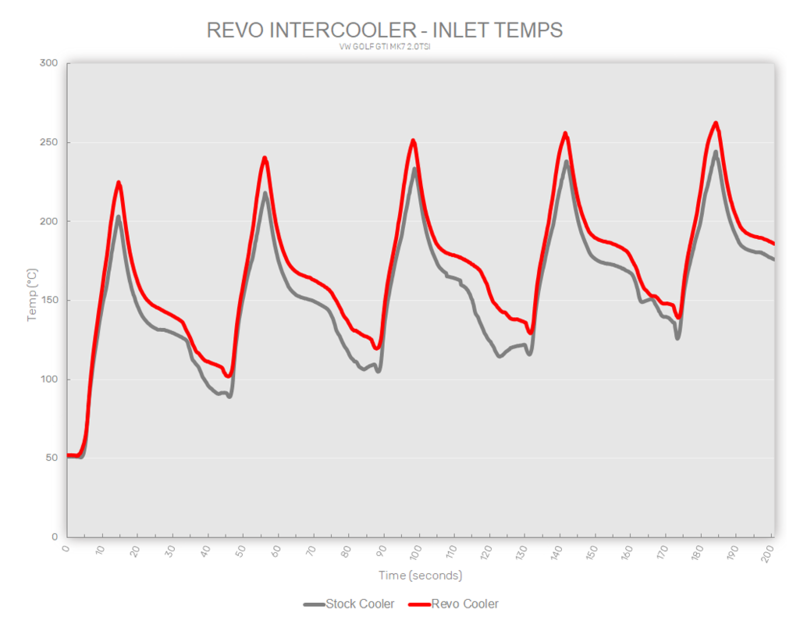 This graph illustrates the increased cooling performance of the Revo intercooler vs OEM Golf R intercooler over all five runs. 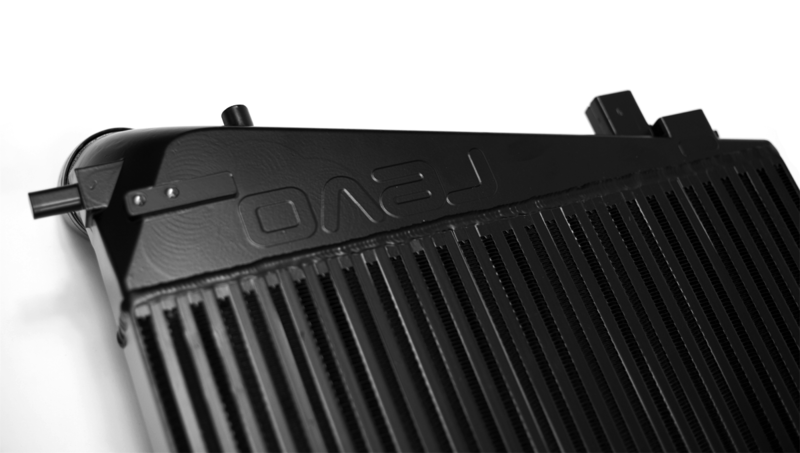 The Revo Intercooler keeps temperatures below 49ºC on the fifth run, lower than the stock on its first at 58ºC. Will not fit on cars with O2 sensors fitted without interference on the sensor. It is recommended to speak with your dealer before if you are unsure.